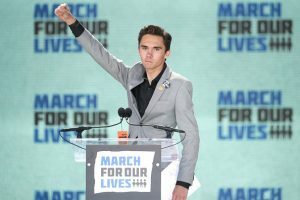 Stoneman Douglas High School shooting survivor David Hogg has become one of the faces of the young movement for gun control in the U.S., and he's hardly been subtle in his demands for sweeping changes to the nation's laws. From a profanity-laced interview with The Outline that called out "pathetic fuckers that want to keep killing our children," to saying Sen. Marco Rubio (R., Fla.) took $1.05 for every student's life in Florida, to calling the National Rifle Association "child murderers," Hogg—who dealt with false accusations of being a crisis actor in the aftermath of the shooting—has taken to inflammatory rhetoric to get his point across. Don't expect Hogg to tone anything down; he told CNN on Monday he hasn't been "provocative enough."